In January I commenced work for Bliss, and in the past six months, I have learnt so much, grown a lt as a person, and am really enjoying the challenge. My role is to recruit volunteers, embed them into hospitals and the community, and support parents who have or have had a baby in special care. 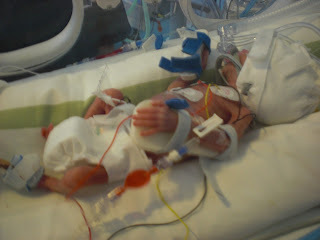 One of the important parts of my job is visiting neonatal units. As a parent, it's never completely easy. It's very easy to identify and empathise with parents. Seeing parents on edge, stressed, elated, terrified often simultaneously, is very hard. It's inspiring too, to see teams working together, to help these tiny babies thrive. The unit Joseph was on, where I spent almost 3 months of my life, has gone, and lies empty. I visited a neighbouring unit yesterday and to my delight many of the nurses who shared our fear, joy, frustrations and setbacks were there, and delighted to see photos of Joseph. Its funny because when I visit units I am in "work mode" there to speak to the manager and staff, assess their needs and wants. I often mention my experience, as it gives me some credibility, but I don't go into detail. Yesterday was odd as I felt a flood of emotion for these amazing nurses. And there were hugs, which I have to say doesn't normally happen at work! I have come to accept now that there are certain things that will never leave me. Obviously, the beeps. They won't ever be a neutral sound. I will never be able to hear a "brady beep" without my heart racing and anxiety rising. I will never be able to hear "I'm just finishing a blood transfusion be right with you" without wanting to put my arm around the frightened mum and whisper that this won't be forever. I will never be able to see a dad walking proudly into the unit with a car seat and not want to cheer, throw streamers and hug everyone in sight. I don't, I might add, but inside I am. And what never ceases to inspire are my amazing volunteers, wanting to give their time to help parents and their babies. What do Bliss volunteers actually do? And do you cover the whole of the UK, or just hospitals local to you?